The following are court results for the Observer area from Hastings Magistrates’ Court from September 27 – October 2. Madeleine De Quay (aged 68), of Rye Harbour Road, Rye, pleaded guilty to driving a Honda Civic on the A268 at Playden on July 10, without due care and attention. She was fined £80 and her driving record endorsed with six penalty points. Ryan Denton (aged 29), of Tower Road West, St Leonards, pleaded guilty to being in possession of a quantity of cannabis. The offence took place at Hastings on August 7. He was fined £80. Raymond Handford (aged 52), of Emmanuel Road, Hastings, pleaded guilty to opening the door of a vehicle so as to injure or endanger a person. The offence took place at Pevensey on July 8. He was given a six month conditional discharge. Robert Kelly (aged 33), of Battle Road, St Leonards, pleaded guilty to driving a Vauxhall Astra on Snowdrop Rise, St Leonards, on August 4, while disqualified from driving. He also pleaded guilty to driving while disqualified on the A268 at Rye Foreign on September 10. He was sentenced to 16 weeks in prison, suspended for one year, and banned from driving for a further 17 months. The court also made a community order with a requirement of 100 hours of unpaid work. 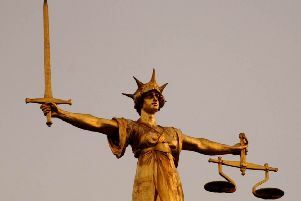 Glen Montague (aged 36), of Salem Street, Maidstone, Kent, pleaded guilty to being in breach of a restraining order. The offence took place at Peasmarsh on September 11. Sentencing was adjourned to allow for probation reports to be prepared. Antony Gow (aged 24), of Holmhurst Lane, St Leonards, pleaded guilty to causing £331.25 damage to a motor vehicle. The offence took place at St Leonards on February 19. He was ordered to pay £281.25 in compensation. Zachary Ben-Abdalla (aged 26), of Greenfields Close, St Leonards, pleaded guilty to using threatening behaviour. The offence took place at Hastings on February 3. The court made a community order. Scott Keywood (aged 40), of Warren Road, Croydon, Surrey, pleaded guilty to driving a Nissan vehicle on Camber Road, Camber, on August 29, while more than twice over the drink drive limit. He gave a breath alcohol reading of 87 microgrammes. The legal limit is 35 microgrammes. He was sentenced to six weeks in prison, suspended for 14 months. Magistrates said the reason for the sentence was that it was his second offence within two years and his third drink-driving offence. They made a community order with a requirement to attend a drink impaired drivers programme. He was fined £500 and banned from driving for three years. Hamid Mosadegh (aged 57), of Mount Pleasant Road, Hastings, was found guilty of driving a Mercedes vehicle on Marina, St Leonards, on January 7, without due care and attention. He was fined £250 and ordered to pay £500 in prosecution costs. His driving record was endorsed with four penalty points. Brian Croucher (aged 58), of Stream Lane, Sedlescombe, was found guilty of failing to provide information relating to the identity of the driver of a vehicle who was alleged to have been guilty of an offence. The offence took place on January 17. He was fined £300 and ordered to pay £300 in prosecution costs. His driving record was endorsed with six penalty points. Robert Gibson (aged 74), of Bracken Close, Crowborough, pleaded guilty to harassing a woman by sending her a letter and attending her place of work. The offence took place at Bexhill between March 1 and April 25. He was given a one year conditional discharge and ordered to pay £500 in prosecution costs. Magistrates also made a restraining order.